We consider the estimation of time-varying channels for Cooperative Orthogonal Frequency Division Multiplexing (CO-OFDM) systems. In the next generation mobile wireless communication systems, significant Doppler frequency shifts are expected the channel frequency response to vary in time. A time-invariant channel is assumed during the transmission of a symbol in the previous studies on CO-OFDM systems, which is not valid in high mobility cases. Estimation of channel parameters is required at the receiver to improve the performance of the system. We estimate the model parameters of the channel from a time-frequency representation of the received signal. We present two approaches for the CO-OFDM channel estimation problem where in the first approach, individual channels are estimated at the relay and destination whereas in the second one, the cascaded source-relay-destination channel is estimated at the destination. Simulation results show that the individual channel estimation approach has better performance in terms of MSE and BER; however it has higher computational cost compared to the cascaded approach. In wireless communication, antenna diversity is intensively used to mitigate fading effects in the recent years. This technique promises significant diversity gain. However due to the size and power limitations of some mobile terminals, antenna diversity may not be practical in some cases (e.g., Wireless Sensor Networks). Cooperative communication [1–3], also referred to as cooperative relaying, has become a popular solution for such cases since it maintains virtual antenna array without utilizing multiple antennas. Single-carrier modulation schemes are usually used in cooperative communication in the case of the flat fading channel . A simple cooperative communication system with a source ( ), a relay ( ), and a destination ( ) terminal is shown in Figure 1. A simple cooperative communication system. As in the traditional mobile OFDM systems, large fluctuations of the channel parameters are expected between and during OFDM symbols in CO-OFDM systems, especially when the terminals are mobile. To combat this problem, accurate modeling and estimation of time-varying channels are required. Early channel estimation methods for CO-OFDM assume a time-invariant model for the channel during the transmission of an OFDM symbol, which is not valid for fast-varying environments [4, 5]. A widely used channel model is a linear time-invariant impulse response where the coefficients are complex Gaussian random variables . In this work we present channel estimation techniques for CO-OFDM systems over time-varying channels. We use the parametric channel model  employed in MIMO-OFDM system discussed in Part I. We consider two different scenarios similar to : (i) is estimated at the relay, and is estimated at the destination individually; (ii) the cascaded channel of and , that is, the equivalent channel impulse response is estimated at the destination terminal. Here denotes the channel response between and , denotes the channel response between and , and is the equivalent cascaded channel response between and . Since no channel estimation is performed at the relay, this approach has the advantage in terms of computational requirement over the first one. We will show here that the parameters of these individual as well as the cascaded time-varying channels can be obtained by means of time-frequency representations of the channel outputs. The rest of the paper is organized as follows. In Section 2, we give a brief summary of the parametric channel model and CO-OFDM signal model. Section 3 presents time-frequency channel estimation for CO-OFDM systems via DET. In Section 4, we present computer simulations to illustrate the performance of proposed channel estimation in both scenarios mentioned above. Conclusions are drawn in Section 5. In this paper, all channels are assumed multipath, fading with long-term path loss, and Doppler frequency shifts. Path loss is proportional to where is the propagation distance between transmitter and receiver, and is the path loss coefficient . Let and are defined as relative gain factors of and links relative to link [7, 9]. Here, , and denote the distances of , , and links, respectively. where is the number of transmission paths, represents the Doppler frequency shift, is the relative attenuation, and is the delay in path . In beyond 3G wireless mobile communication systems, Doppler frequency shifts become significant and have to be taken into account. The spreading function displays peaks located at the time-frequency positions determined by the delays and the corresponding Doppler frequencies, with as their amplitudes. In this study, we extract the individual as well as the cascaded channel information from the spreading function of the received signals at the relay and at the destination. In our second approach, instead of estimating the individual channel parameters, we obtain the equivalent , and parameters. We consider an Amplify-and-Forward (AF) cooperative transmission model where a source sends information to a destination with the assistance of a relay [3, 10]. In this model, all of the terminals are equipped with only one transmit and one receive antenna. To manage cooperative transmission, we consider a special protocol which is originally proposed in  and named "Protocol II". According to this protocol, total transmission is divided in two phases. In Phase I, source sends OFDM signal to both relay and destination terminals. Relay terminal amplifies the received signal in the same phase. In Phase II, relay terminal transmits the amplified signal to the destination terminal. where is the frequency response of the almost time-invariant channel and is the DFT of the . By estimating the channel frequency response coefficients , data symbols, , can be recovered according to (12). Estimation of the channel coefficients is usually achieved by using training symbols , called pilots inserted between data symbols. Then the transfer function is interpolated from the responses to by using different filtering techniques. This is called Pilot Symbol Assisted (PSA) channel estimation . However, in beyond 3G communication systems, fast moving terminals and scatterers are expected in the environment, causing the Doppler frequency shifts to become significant which makes the above assumption invalid. In this paper, we consider a completely time-varying model for the CO-OFDM channels where the parameters may change during one transmit symbol , based on the time-frequency approach. In this section we consider the estimation procedure of time-varying CO-OFDM channels , as well as the cascaded channels. We approach the channel estimation problem from a time-frequency point of view and employ the channel estimation technique proposed in Part I of this series. Details on the Discrete Evolutionary Transform (DET) that we use here as a time-frequency representation of time-varying CO-OFDM channels may be found in Section of Part I. The time-varying frequency response or equivalently the spreading function of the individual as well as the cascaded channels may be calculated by means of the DET of the received signal. We consider two channel estimation approaches for the CO-OFDM system illustrated in Figure 1. The channel is estimated at the relay terminal, then the transmitted signal is amplified, and new pilot symbols are inserted for the estimation of channel. The pilot symbols that are inserted at the source are effected by the multipath fading nature of the channel, as such may not be used for the estimation of channel. Therefore, we need to insert fresh pilot symbols and extend the length of the OFDM symbol at the relay. The estimated channel information is quantized and transmitted to the destination together with the data symbols. Then at the destination terminal, the channel is estimated and used for the detection. Parameters of both and channel impulse responses are estimated according to the procedure explained in Section of Part I. The relay terminal does not perform any channel estimation. The cascaded channel is estimated at the destination terminal. Calculation of in such a way that it satisfies (17) is explained in Section of Part I by using windows that are adapted to the Doppler frequencies. According to the above equation, we need the input pilot symbols to estimate the channel frequency response. Here we consider simple, uniform pilot patterns; however improved patterns may be employed as well . Note that, the evolutionary kernel can be calculated directly from , and all unknown channel parameters can be estimated according to (21) and (22) for a time-varying model that does not require any stationarity assumption. Estimated channel parameters are used for the detection at the destination terminal according to the channel equalization algorithm presented in Section .2 of Part I. In the following, we demonstrate the time-frequency channel estimation as well as the detection performance of our approach by means of examples. In our simulations, a CO-OFDM system scenario with a source, a relay, and a destination terminal is considered with the following parameters: the distances and are chosen such that the relative gain ratio takes the values dB, where the path loss coefficient is assumed to be . The angle between and propagation paths is taken as . The performance of both individual and cascaded channel estimation approaches is investigated by means of the mean square error (MSE) and the bit error rate (BER) according to varying signal-to-noise ratios. QPSK-coded data symbols are modulated onto subcarriers to generate one OFDM symbol. 16 equally spaced pilot symbols are inserted into OFDM symbols. The , , and channels are simulated randomly. For each of these channels, the maximum number of paths is set to where the delays and the attenuations on each path are chosen as independent, normal distributed random variables. Normalized Doppler frequency on each path is fixed to . The channel output is corrupted by zero-mean AWGN whose SNR is changed between and dB. Individual Channel Estimation Results. The and channels are estimated at the corresponding terminals and are available at the destination. Moreover, the channel is estimated at the destination by using the signal . Then data symbols are detected from the received signals and by using this channel information. Figure 2(a) shows the total MSE of the channel estimations and for in dB. We see that we obtain the best channel estimation for dB which corresponds to equal distance between and . 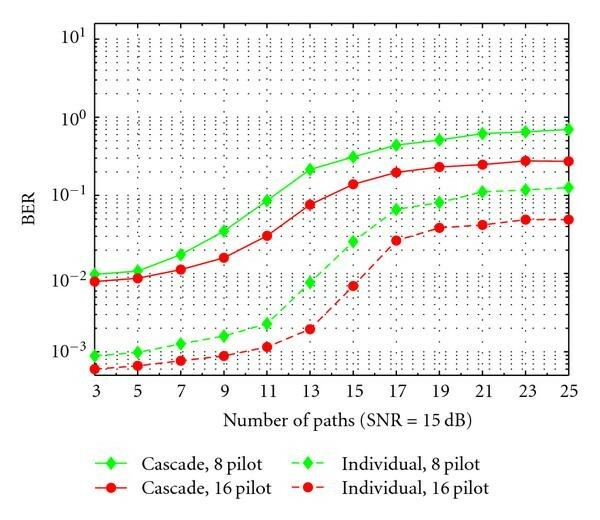 We give the BER performances at different channel noise levels for dB in Figure 2(b). We also compare and present our results with the performance of the perfect channel state information (CSI) in the same figure. Similar to the MSE, we have the closest BER performance to the perfect CSI for the case of dB. We observe from this figure that, the "individual approach for 0 dB" has about 5 dB SNR gain over the "individual 40 dB" at BER . Cascaded Channel Estimation Results: The combined channel is estimated at the destination terminal from . The channel is estimated at the destination by using the signal . Data symbols are detected from and by using estimated channel parameters. Figure 3(a) shows the MSE of the cascaded channel estimation for dB. Note that we obtain almost the same estimation performance for and dB and obtain better results for dB as in the individual channel estimation case. We show the BER performance for dB, as well as for the perfect CSI case in Figure 3(b). The noise floors in the figures are due to the fact that we do not consider advanced detection techniques for the receiver in our studies. Our main concern is the estimation of the time-varying channel. By using more advanced detection methods, error floors shown in our figures may be reduced. Performance of the individual channel estimation approach. (a) MSE versus SNR, (b) BER performance versus SNR. Performance of the cascaded channel estimation approach. (a) Change in the MSE by SNR, (b) BER versus SNR. Notice that the individual channel estimation approach outperforms the cascaded approach in terms of both MSE and BER as expected, at the expense of twice the computational complexity. This comes from the fact that relay terminal estimates the channel and transmits to the destination with an increased symbol duration due to the insertion of new pilot symbols. In approach two, the relay does not perform any channel estimation; hence the computational burden is reduced. However, the estimated combined channel parameters are not as reliable as in the first approach. We have also investigated the effect of the number of pilots to the channel estimation performance in both approaches. We show the BER and MSE plots in Figures 4(a) and 4(b), respectively, for . Notice that increasing the number of pilots improves the BER performance in both approaches especially the cascaded approach. Effect of the number of pilots in both approaches. (a) Change of MSE by SNR, (b) change of BER by SNR. The effect of the number of channel paths on the BER is illustrated by a simulation where the number of pilots is taken as and the SNR = dB. The number of paths is changed between and , and the BER is presented in Figure 5. Note that both approaches equally suffer from increasing the number of paths. BER performance change by the number of channel paths for and pilots, and dB SNR. In this paper, we present a time-varying channel estimation technique for CO-OFDM systems. We propose two approaches where in the first one, individual channels are estimated at the relay and destination whereas in the second approach, the cascaded source-relay-destination channel is estimated at the destination. We assume that the communication channels are multipath and affected by considerable Doppler frequencies. Simulation results show that the individual channel estimation approach gives better performance than the cascaded approach in terms of both estimation error and the bit error rate. However, in the cascaded channel estimation case, the computational cost is reduced significantly at the expense of decreased performance. We observe that the best performance is achieved when the distances of source-to-relay and relay-to-destination is equal, for both approaches. This work was supported by The Research Fund of The University of Istanbul, project nos. 6904, 2875, and 6687.